As people who care about the world, we know it’s easy to forget to take care of ourselves. Our movements and organisations often need a lot of dedication, and sometimes value overwork as a sign of strength. Too often we risk weakening them through exhausting ourselves. To help us stay nourished, creative and inspired for the long haul, we need to value our own health and wellbeing, and learn ways of becoming more resilient and work more supportively together. 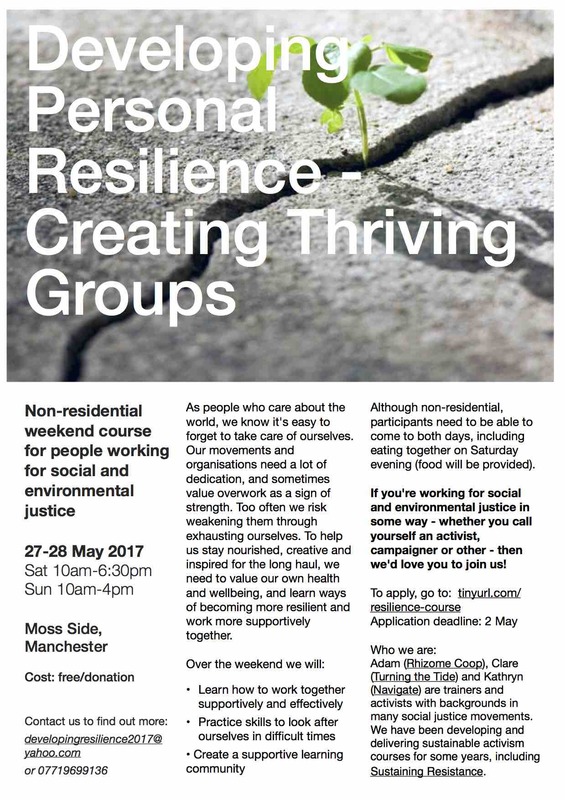 A free weekend course for people working for social and environmental justice, to learn together how to sustain ourselves in our struggles for a just, peaceful, and healthy world. Although non-residential, participants need to be able to come to both days, including eating together at the end of the day on Saturday (food will be provided). People working for social justice, whether you call yourself an activist or campaigner or not, paid or unpaid, who want to learn healthier ways of working together and looking after themselves. People who want to make their movements, support work, and campaigns more sustainable, even joyous! Tell us about yourself and why you want to take part here. Application deadline: 2 May 2017. Adam (Rhizome Coop), Clare (Turning the Tide) and Kathryn (Navigate) are trainers and activists with backgrounds in many social justice movements. We have been developing and delivering sustainable activism courses for some years, including Sustaining Resistance. This course is possible due to funding that covers the venue and food costs; the facilitators are donating their time.